The launch of Skype Lite mobile app has been announced by the Microsoft. The upcoming app is of only 13 MB size and is expected to work well in the low-speed data connections. Satya Nadella, the CEO of the company showcased the app at Future Decoded event in Mumbai. 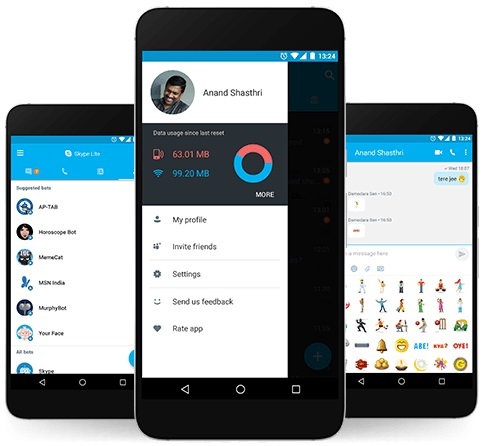 Using the Skype Lite app, the people in India will be able to make video and audio calls besides messaging. The app which was developed by the employees of the Microsoft development centre at Hyderabad has been tested with the users in India. The application will be available in Indian regional languages such as Urdu, Telugu, Tamil, Marathi, Hindi, Bengali and Gujarati. There are also features like Wi-Fi and mobile data usage monitoring, SMS filtering and India focused Skype Bots. The Skype Lite app by Microsoft is powered by Aadhaar integration for the Indian users. According to the company, the app will work even on 2G networks to make voice or video calls and send messages in addition to relying on machine learning to de-clutter spam messages. Another interesting feature of the app is the integration of Aadhaar which will be available by June 2017. It will allow the users to confirm the identity of callers from unknown sources. The app is likely to give some tough time for other social networking lite apps such as WhatsApp and Facebook Lite. However, let us know your reviews on the Skype Lite app by commenting in the comments section below. You might also like our TUTEZONE section which contains exclusive tutorials on how to make our life simpler using technology.